I like running, hiking, summits, and ham radio. Well, lots of other things, too. But this is about those four things. Since I started doing SOTA, I’ve wanted to try to put together an HF summit activation kit for use on trail runs. I’ve done a a few SOTA activations while trail running, but it had always been with just a hand-held radio—usually my tiny Yaesu VX-2R with a 12-inch ultra-flexible whip antenna, or an MFJ “Long Ranger” telescoping antenna. On most of my activations, I’ve used a SOTABeams “Band Hopper” with my FT-817. It’s a resonant dipole for 40 and 20 meters, with a nice convenient bag, stakes, guy lines and 1:1 balun. It’s a very nice antenna, easy to set up. But it’s a bit on the heavy side compared to an end-fed half-wave (EFHW) antenna. And not quite as easy to throw into a tree. I built myself a SOTA Tuner from QRP Kits, and cut a length of wire for 40m, with a link in the middle in case I want to do only 20m. I used wire and a winder from SOTABeams. This is excellent lightweight wire for building your own antennas. 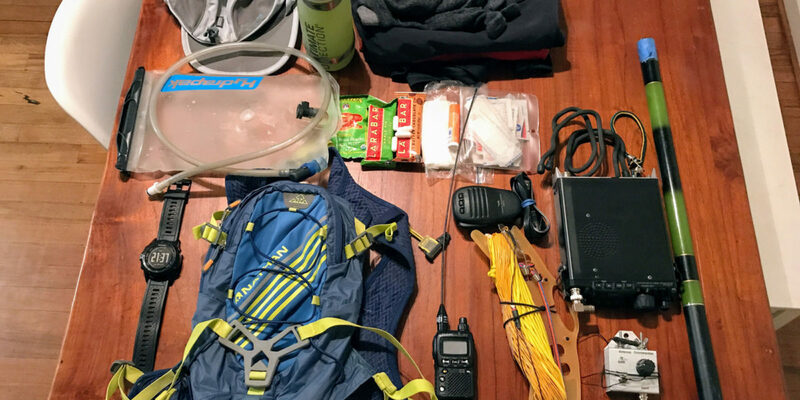 After getting familiar with setup of this antenna on a camping trip, I decided I wanted to see if I could get this antenna, my FT-817, microphone, and other support accessories into my running pack/vest—along with all of the necessities for a run. As it turns out, it’s possible. Just barely! And while feasible in the summer, may not be feasible in colder seasons, due to the need to pack cold-weather items. The 5m “squid pole” and my hydration water mix are hand-carried. As you can see, it all fits! Mostly thanks to a very nicely designed pack! I don’t think they make the same model anymore, but there’s a very similar one on Nathan’s site. It’s a very small pack! So, with the water bladder in there, the FT-817 just barely fits. This is actually a really good thing—a snug fit keeps the radio from moving around a lot so it’s naturally protected from much shock as I run the trails. I haven’t had a chance to weigh the whole package yet, but I’m fairly certain it comes in at around 3.5kg / 7.8lbs. I can run 12-18mi (20-30km) with this setup, depending on elevation, though my typical runs with it are around 6-10mi (10-16km). I’m currently working on replacing the hand mic with a lightweight headset, roughly following Alex PY1AHD‘s idea. This will shave a bit of weight and make operation a bit easier. Down the road, of course, I plan on getting proficient with morse/CW, and getting a lightweight CW-only rig. This will cut size and weight considerably, extending my range and comfort.